Prototype: High tension current train for erecting catenary, as it looked in the German Federal Railroad's (DB) Era IIIb, consisting of a catenary erecting car (former type R10 with a brakeman's cab), car for drums of wire (former type R10), material supplies car (former type G car) and bunk car (former Wurttemberg corridor car). 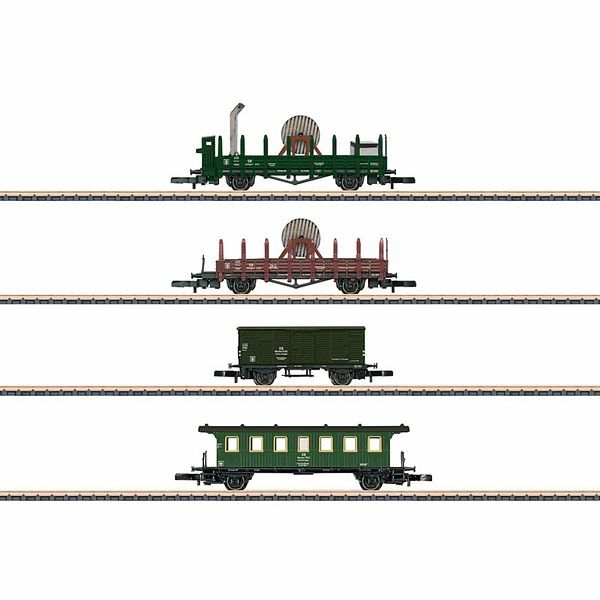 Model: The car set consists of 2 former type R10 cars, loaded with the typical equipment and supplies for a catenary erecting train. The loads are made of real wood. There is a material supplies car and a bunk car. All of the cars are extensively painted and imprinted. Length over the buffers about 216 mm / 8-1/2".